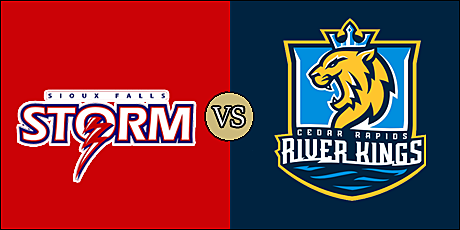 What: The Storm open their 2019 in Cedar Rapids against the River Kings. When: Friday, February 23 at 5:05 p.m. pacific (7:05 p.m. central). The Storm are the most successful team in the history of the IFL. They have appeared in nine straight United Bowls, winning six straight from 2011 to 2016. Sioux Falls came up short to the Iowa Barnstormers in last season's United Bowl, 42-38. Kurtiss Riggs is entering his 17th season as head coach of the Storm. The River Kings are looking for a fresh start after finishing 3-11 a season ago. There's new ownership, new management and a new identity as they re-branded over the off season from the Titans to the River Kings. Mark Stoute, who went 43-17 with the Titans and led them to four playoff appearances from 2013 to 2016, returns as the team's head coach. Storm QB Lorenzo Brown (right) and the offense. River Kings WR Marquel Wade. This match up is among the oldest rivalries in the IFL. The Storm have appeared in the last nine United Bowls. After a downturn in the past few years, the River Kings, formerly the Titans, are ready for a new emergence with new ownership and front office leadership. Kurtiss Riggs leads the Storm into his 17th season with the team. He is a four-time Coach of the Year and has amassed a 228-41 record. Mark Stoute will be back in familiar territory in Cedar Rapids, having had coached the team for four years, including four playoff appearance. Stoute, who began last season as head coach of the Nebraska Danger, compiled a 40-17 record with the Titans. The Storm return some stellar veteran performers. Lorenzo Brown returns under center, and he's a good one. 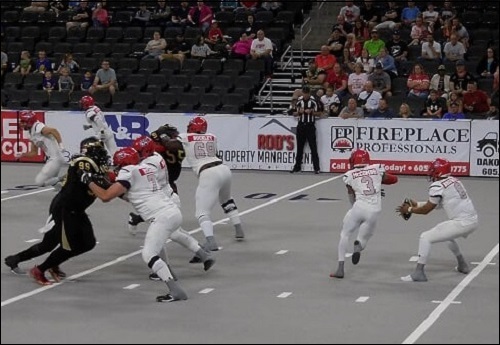 He was second in the IFL in passing yards in 2018 with 2,203, and third with 38 touchdown tosses. He also led the league in rushing touchdowns with 24. The team also returns a couple of 2018 All-IFL offensive linemen in Forrestal Hickman and Lawrence Martin IV. Defensive back Trey Wafford, whose 88 tackles ranked fourth in the IFL last season, was also named to the All-IFL team. He had been named the league's Rookie of the Year in 2017. Reliable Miles Bergner is back as the team's kicker. He was an indoor football admirable 65 percent on field goal attempts in 2018, and his 143 points ranked him third in the IFL. The River Kings are posed to make some noise this season. An all-but afterthought by previous owner Chris Kokalis, the team is under the new ownership of Roy Choi and Matt Stone. Last season's stellar quarterback Jake Medlock is gone. The starting job is up for grabs but, whomever it is, will have a talented group of receivers to which to throw. 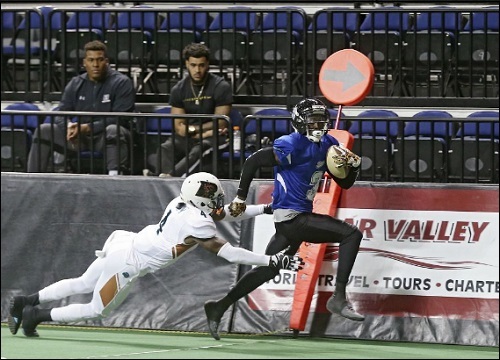 Marquel Wade, who led the league with his 64 receptions, was second in the IFL with 691 receiving yards. Javon Bell was right behind him with 55 receptions for 564 yards. Rookie running back Kalif Phillips holds UNC-Charlotte career records with 4,020 rushing yards and 41 rushing touchdowns. Defensive back Ricky Johnson had 72 tackles and 10 pass break ups for Cedar Rapids in 2014. The River Kings uniforms look cool. I like what they've done there. Touchdown Storm. Darrian Miller 3 yard run. Miles Bergner kick. Touchdown River Kings. Nathaniel Chavious 1 yard run. Henry Nell kick. FG Storm. Miles Bergner 31 yards. Touchdown River Kings. Marquel Wade 21 yard pass from Kurt Palandech. Henry Nall kick. Touchdown Storm. Tra'Von Chapman 48 yard kickoff return. Miles Bergner kick. Touchdown River Kings. Jordan Smith 29 yard pass from Kurt Palandech. Henry Nall kick. Touchdown Storm. Darrian Miller 33 yard run. Miles Bergner kick. Touchdown River Kings. Kurt Palandech 10 yard run. Henry Nall kick. Touchdown Storm. Brandon Sheperd 32 yard pass from Lorenzo Brown. Miles Bergner kick. Iowa Barnstormers head coach Dixie Wooten is in the house. Touchdown River Kings. Marquel Wade 27 yard pass from Kurt Palandech. Kick blocked. FG Storm. Miles Bergner 14 yards.